Why Should I Forgive Myself? A good friend of mine, a priest, was talking to me about growth. During this conversation, he pointed out how forgiveness of self is just as important as forgiveness of others. “Actually”, he continued, “if we don’t’ forgive ourselves, it becomes impossible to forgive others.” My head did a double take on that. A gigantic lesson was being placed in front of me, one to which I knew I had to pay attention. We spoke of many things that afternoon, but I would like to pay particular attention to this thought. It all begins with Christ and His love and forgiveness for us. This is not just a pretty grouping of words, but rather it is the heart of Christianity. When all is said and done, the central theme of Christianity, Catholicism, all revolve around Christ. He knows who we are. He knows what we are. He knows that we don’t always accomplish the good, we desire. However, His love for us is constant, always there. Yes, we must strive to do better with our lives. Yes, we must strive to return this love to Him. But, in spite of our slips, our falls, our downright evil actions, He is constantly loving us and desiring our love in return. So, think about this, to Jesus, what we did last night, what we want to do today…He forgives and loves us. What we did in our distant past…He forgives and loves us. He knows that once we accept His forgiveness….wait….really accept His forgiveness, feeling truly sorry for our actions, craving to become more like Him and loving Him, as He is, in us and others, then we have truly begun our journey to and with Him. Do we know we are forgiven? Do we know that Jesus loves us? Take out the “we” and “us” and let it read, “Do I know I am forgiven?” Do I know that Jesus loves me?” Why is it so important for us to know these things? You and I are no different than ANY other person walking this earth. Think of the best in your eyes, and think of the worst in your eyes. We are all alike. There is no best and worst. We are all loved by and forgiven by Jesus. We cannot look upon others any differently than we look upon ourselves. We have all sinned. Because of us, it was necessary for Jesus to come into this world. And because of Jesus, we are all saved. 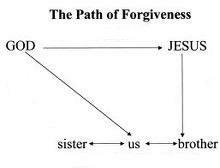 What we have to do is acknowledge, accept, and embrace the love and forgiveness of Jesus. There is one last thing that we should consider. It can be very informative to us. If we DO find fault in others, if we find it difficult to embrace others with their problems, their faults, their way of living, THEN we have not yet forgiven ourselves the way Christ wants us to forgive. We do not have to embrace other’s problems, other’s faults, other’s way of living, but the person saddled with these, we must embrace, we must forgive. Forgiveness is a willed action, not a feeling action. 135,286 have viewed this site.